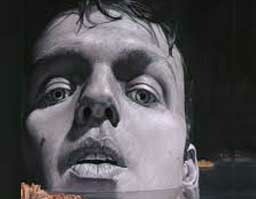 Ian Ingram from New York is the 500th artist to join us on FigurativeArtist.org. His works is done in charcoal, mixed media and some also features some embroidery. I’d love to see it in the flesh but have to just enjoy his fine site for now. His site has a magnifying glass feature that lets you get up close and personal with each piece. I was counting carefully to see who came in as number 500 but somehow had added something up wrongly. I had to carefully go back from our real current number of 507 so see who came through the door with their permission slip. I only move people from accepting my invitation to actual members once they send back their permission and info form.We’ll be updating the site in the next 2 weeks to show off all our new members, at least 61 of them but I’m sure we’ll have more over the next 2 weeks. If you have some free time and like to visit artists’ sites I would love to have you as one of my researchers. I already have a big list of artists whose fine work has caught my eye. I can send you a little chunk on a spreadsheet and you could find their sites and email addresses for me. This would help me enormously as I would then only have to assess the site/work and then send out my invitation to a group of them. Finding their sites can be very quick or take a bit of searching and some just can’t be found. If their site can’t be found but their work is interesting, I mark those to look up again next year. Please let me know if you would like to help with some research for me and I’ll send you some names to look up. I do pick away at this fine project after hours and if all my time is spent just locating artist’s site, that takes time away from working on the blog or publicizing our site in any way. Anyway, I’m off to work now, can’t put it off any longer. Will bake some celebratory brownies this afternoon and pig out tonight to celebrate our 500th member in just one year. Keep up the good work in the studio, guys and gals and spread the word about our fine site.